The wide applicability of the Fair Housing Act helps people with disabilities live independently in community settings. A few months ago, RCM of Washington contacted the ERC with a fair housing concern. RCM of Washington is a nonprofit organization that provides services to people with intellectual and developmental disabilities. As part of these services, RCM rents several residences in the District for individuals with intellectual and developmental disabilities so that they can live independently in the community as opposed to in institutionalized settings. 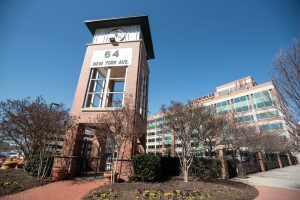 While RCM is the lessee for the properties, the homes serve as the primary residences for local D.C. residents with intellectual and developmental disabilities. Most of us take for granted the residential trash and recycling pick up provided by the city through the D.C. Department of Public Works (DPW). However, because these residences listed an organization and not specific individuals on the lease, DPW determined that these homes were under commercial lease. As such, DPW, the government agency that handles sanitation services, refused to provide trash and recycling collection services to these homes. Instead, RCM was told they would need to engage commercial sanitation services at a cost of thousands of dollars per month. The ERC submitted a reasonable accommodation request to D.C. Department of Public Works (DPW) on behalf of the individuals served by RCM of Washington, requesting that DPW provide trash and recycling services at their homes. DPW granted the reasonable accommodation request, so starting this Intellectual and Developmental Disabilities Awareness Month, several dozen D.C. residents with intellectual and development disabilities will now be able to receive trash and recycling pick up from the city, saving RCM thousands of dollars per month. As illustrated by this recent success, the Fair Housing Act (FHA) is far-reaching and can touch entities beyond housing providers. March is Intellectual and Developmental Disabilities Awareness Month. Intellectual disabilities refer to disabilities limiting a person’s abilities surrounding intellectual functioning and adaptive behavior. Developmental disabilities are disabilities that develop in a person’s youth and generally affect a person throughout their life. Examples of developmental disabilities include autism, Down syndrome, and cerebral palsy. There is overlap between the two types of disabilities and some people may have both, but others may have an intellectual disability without it meeting the definition of a developmental disability, or vice versa. Some people with intellectual or developmental disabilities can find it difficult to be self-sufficient if they do not receive proper support from their communities. Throughout history, people with intellectual and developmental disabilities have often been forced to live in institutions, which are typically ill-equipped to meet their needs. Many disability rights activists oppose institutionalization and believe that people with disabilities should have the right to live independently, integrated into their local communities. Robust fair housing laws are among the various tools available to people with disabilities to ensure their access to independent living in the neighborhoods of their choosing. In 1968, the passage of the Fair Housing Act (FHA) banned discrimination in housing-related transactions based on race, color, national origin, and religion. The Fair Housing Amendments Act (FHAA) added protections for people with disabilities in 1988. Many local jurisdictions, such as cities and states, make it illegal to discriminate based on additional protected classes as well. Although discrimination has not been entirely eliminated, the FHA has undeniably made a major impact on the ability of many to buy, rent, and/or equally enjoy and use a home. It continues to do so today, especially for people with disabilities. People with disabilities are granted a multitude of fair housing rights thanks to civil rights laws, including the right to request reasonable accommodations. A reasonable accommodation is a change, exemption, or adjustment to a rule, policy, practice or service that may be necessary for a person with a disability to have an equal opportunity to enjoy a dwelling. In 2017, about half of the disability-related housing discrimination intakes received by the ERC were in regards to a housing provider ignoring or unfairly denying a reasonable accommodation request. Many people assume that the requirements of the FHA apply only to housing providers, such as landlords, property managers, and realtors. While it’s true that it is illegal for housing providers to discriminate on the basis of any of the protected classes, the FHA can also apply to entities that are not generally perceived to be housing providers, such as homeless shelters, mortgage lenders, and local governments. For example, the FHA allows for people with disabilities to have assistance animals in their homes or in housing units and common areas of multifamily housing as a reasonable accommodation. An assistance animal is any animal that provides benefit to somebody with a disability. In Prince George’s County, Maryland, people are not allowed to own pit bulls, a specific breed of dog. Under the FHA, however, a person with a disability whose assistance animal is a pit bull would be exempt from the ban, even though the breed ban is implemented and enforced by the county, and not housing providers. In this instance, the county is beholden to fair housing laws in order to ensure that people with disabilities have the same access to housing as others without disabilities. Another example is zoning laws instituted by some cities and counties that put a limit on the number of unrelated residents that can reside in a household. In this instance, small group homes for people with disabilities could request an exemption from the local zoning board as a reasonable accommodation. Accommodations such as this one allow people with disabilities to live independently and more easily integrate into local communities. Finally, the recent success by the ERC in its advocacy on behalf of RCM of Washington also illustrates how far-reaching fair housing protections can help people with disabilities live independently. The scope of the FHA allows people with disabilities to enjoy civil rights protections in various aspects of their lives, live self-sufficiently, and become part of a local community. The ERC is committed to working on behalf of people with disabilities and ensuring that they have full access to their fair housing rights. To learn more about how to request a reasonable accommodation, check out this ERC advice column. If you believe you may have experienced discrimination in housing, you can contact the Equal Rights Center. To report your experience, please call 202-234-3062 or email info@equalrightscenter.org.